The above map shows Rally events for this month. Please check below for more details and check with event organisers before travelling. 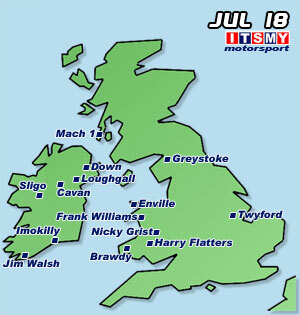 RAF Brawdy, South Wales hosts the Brawdy Stages organised by Pembrokeshire MC. A single venue there are 60 stage miles over 6 stages. The Mach 1 Stages is at Machrihanish Airbase, Kintyre, Argyll. Marshal's are needed and you will be given a warm welcome. The organisers are Dunfermline Car Club. 89 stage miles over 12 special stages. First car 1100hrs (sat14) and resume 0800hrs (sun15). The European Rally Championship moves to the Italian capital of Rome. Day one sees two cars competing together in centre followed by two days around Frosinone and in the Simbruini Mountains. Three super specials and 12 other stages. If you've never visited Roma, make the trip one year to this amazing City and excellent event. At Twyford Wood, Colsterworth off the A1. Organised by Mid-Derbyshire MC it's a round of the ANCC, ANWCC, ANEMMC and EMAMC Championships. Twyford is tough on cars with badly broken concrete and soft gravel. There will be 8 stages with a total of 65 competitive miles. First car 0900hrs. Neste Rally Finland hosts the WRC. Massive jumps make the rally particularly on stages like Ouninpohja. The gravel stages are all public roads. Shakedown is Vesala on Thu followed by ss1 at Harju 1900hrs. Friday starts with Moksi at 0818. Service is Jyvaskyla as usual.